Hey, Arrow fans sorry this is late at night, but I have a few minutes to type this up fast before bed. This episode was a bit crazy because Stanley came back to get his revenge on Oliver. Or was it to make him understand why he was doing this. I will get into that a bit later but first, let’s talk about Felicity and Oliver trying to parent William. If it were me, I would spank him and see if he would decide to throw his life away then. Yeah, it was hard watching those scenes because Oliver and Felicity are trying to do their best raising William even though they fight for the city every night. What confuses me is that in the future William says that Oliver and Felicity abandon him. Later on, in the episode William decided to have a normal life that he could not get with Oliver and Felicity. So, why are you mad saying oh my mom and dad abandoned me. Yeah but William decided to leave and wanted a normal life am I the only one who is making this connection right now. So the team working together again is still growing on me, but then the writers shut it down because Curtis is leaving to go to Washington. Wow, the team has been together for five seconds, and already someone decided to leave. Bye Curtis! What made me mad was that William called his grandparents to take him away which was a surprise to me because I did not know they existed. Then they are going to be bold and say hey we are taking William. First of all, I would not care who that person is you can not just walk up in my house and take my child. The team goes into Stanley’s den to find him, but it takes a bloody turn where Dinah almost died. As torn up as she is in the future I bet she died multiple times. 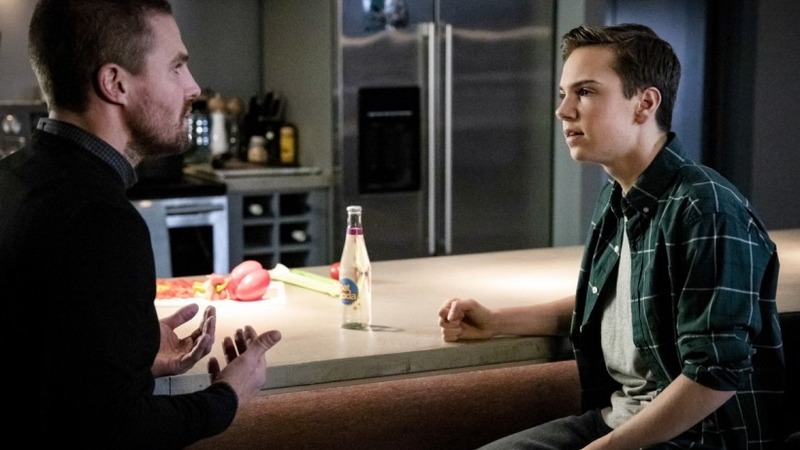 After Oliver takes down Stanley with the help of William and Felicity, Can we take a minute and give that guy a round of applause because he was the best villain of the week. I give Stanley a 10 out of 10 for this week’s episode. I am happy for Felicity because Curtis gave her Helix dynamics to ensure that Felicity has a chance to change the world. Another thing that happened is that Felicity is pregnant you guys. Yep, I said it pregnant and boy it was a shock to her because they just lost one kid and gained another all in one day now that’s funny. Flashforwards I am still not a fan because they do not make sense a little bit. So the writers were supposed to have Black star and William Know each other, but they did not want to give it away for the viewers. Oh yeah just FYI Black star is Oliver and Felicity’s daughter now that was not a surprise for me at all. So the good news is Felicity might not be dead in the future I do not believe that she is until I see a body I do not pronounce them dead. Okay, theory for Black Star would be that when she is born Oliver and Felicity will give her to Felicity’s parents when the time is right for her to go. Something happened down the line with their daughter. Let me know what theories you will have for next episode and what they did to their daughter.